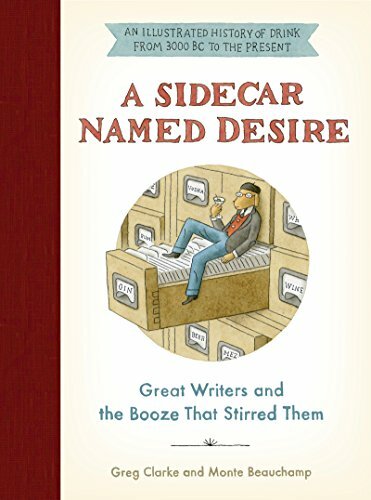 With a clever title, A Sidecar Named Desire, authors Greg Clarke and Monte Beauchamp delve into the history of alcohol and its relationship to famous authors. Clarke and Beauchamp break the book into eight chapters, each dedicated to a particular spirit and the strong relationship authors had with each, but the authors go further than just the writers as they take us into the history of each variety. Eight simple chapters—Wine, Beer, Whiskey, Gin, Vodka, Absinthe, Mezcal & Tequila, and Rum—take the reader on a trip that should be enjoyed with a glass of wine, or beer, or whiskey, or . . . well, you get the picture. Wine, a logical place to start, “Many historians consider ancient Georgia to be the birthplace of wine.” And thus starts a journey around the world—China, Persia, Egypt, and of course Italy and France bringing us right up to America and California wines. While educating us on the grape, they share clips from various authors’ writings and lives that give us insight into the relationships between author and wine. Clarke and Beauchamp carry this process throughout the book—the history of the alcohol being discussed, and the famous people associated with it. In the chapter about beer, we learn that Jane Austen was not only a beer drinker, but a brewer as well. A recipe of her Spruce Beer can be found in this chapter. We learn of the history behind Dorchester Ale and find a recipe for a “home-brewed ale made in the country pubs of (Thomas) Hardy’s Wessex.” It appears a bit daunting, and a lot of hard work, but beer lovers could find themselves in love with it. Moving into Whiskey, we learn that “The art of distillation . . . may have begun as early as 2000 BCE in China, Egypt, or Mesopotamia. Moving to Scotland, Scotch whiskey was “embraced as the country’s national drink.” Robert Burns describes Scotch as inspirations. Of course, a discussion about whiskey would be empty without bringing bourbon into the fray. It’s origin sparks conflict as some are convinced it got its start in upstate Kentucky in Bourbon County, but others swear they can trace its origins in New Orleans. The one thing everyone agrees on is that bourbon’s birthplace is the American South. Of course, the discussion about alcohol would not be complete without a dash of gin. The gin craze started in London with the Gin Act of 1736, designed to curb consumption, but in reality sparked rioting in the streets. Gin and tonic became a favorite of British soldiers in the 1800s, and eventually made its way across the ocean. During Prohibition, gin became a favorite with bootleggers because it was so quickly and easily made. Gin is a popular basis for cocktails, and this chapter shares several recipes such as the Ramos Gin Fizz—a favorite of Tennessee Williams; the martini, an ‘“elixir of quietude” according to E. B. White who “mentioned . . . to a friend that a single dry martini could effectively dislodge his occasional writer’s block.” Of course, there are ongoing discussions about the proper proportions of gin-to-vermouth when creating the perfect martini, but that is left to others to decide. But not all authors found solace in alcohol. Leo Tolstoy “regarded vodka . . . as a profitable instrument of suppression of the peasantry by the autocracy.” He founded a temperance society and used his artistic skills to denigrate vodka as a poison. Tolstoy was certainly in the minority. Recipes in this chapter include the famous vodka martini of James Bond fame, and the screwdriver, an ever-popular drink. One of the most popular drinks is the Bloody Mary, presumably created in the 1920s at Harry’s New York Bar in Paris. It wasn’t until the 1930s when the drink began to appear in America. Of course, Ernest Hemingway, a man who knew his way around both a typewriter and a bar, created his own version of the drink. Gratefully, we can find it in this chapter. Probably one of the least known of the alcohols discussed in this book is absinthe. A drink made from wormwood, its history is reflected as being traced back to Egypt, Greece, and Rome. Absinthe was at one time used as a medicine. “During the French conquest of Algeria (1830–1847), soldiers were provided regular field rations of absinthe to ward off fevers, malaria, and dysentery.” During the late 19th century, French vineyards experienced a wine blight that decimated much of the industry. Although devastating to the wine industry, this blight created a windfall for the absinthe industry. In chapter seven, Clarke and Beauchamp take us south of the border to learn about mescal and tequila. Tequila made its way into American at the Chicago World’s Fair, and in World War I and its popularity rose during Prohibition. Much of the discussion of this topic refers to author Malcolm Lowry’s 1947 novel Under the Volcano. Lowry enjoyed his drink, and having lived in Mexico, he references mezcal and tequila throughout the story. Clarke and Beauchamp explain the difference between tequila and mezcal—how each is produced and which drink hails from which region of Mexico. The chapter would not be complete without at least one recipe, and for this chapter that would be the Classic (Unblended) Margarita. And of course, there is the worm. We learn that “tequila never had a worm.” However, the worm may have found its way into some mezcals. The very idea of a worm in the bottle may just be nothing more than a marketing ploy to boost sales. This journey ends with rum! Robert Louis Stevenson’s Treasure Island had every imaginable curio of the pirate, including references to rum. Grog, a rum drink diluted with lime juice, guarded against scurvy. Writer’s with a relationship to rum included Hart Crane, Edna St. Vincent Millay, and not to be left behind, Ernest Hemingway. The Papa Doble (the Hemingway Daiquiri) recipe can be found neatly tucked away in this chapter. For a little book, it is a veritable wealth of information. For those with a bar, this book should be on the back shelf; for those without a bar, be sure to place it close to any of the alcohol bottles mentioned here. The operative thought is that A Sidecar Named Desire belongs with your booze!